This is Loongsoul Doll 1/3 doll discussion thread. Oh, he's gorgeous! I love that little smile! Carried off into the ocean. Any week now and Halrein, my Kylin dragon should be here. I hope Loongsoul is doing well with keeping up on order promises. Just too excited I can't believe it's already been 5 months. It doesn't seem like I've waited this long. how well can a loogsoul pose? Girrl has a number of photostories that show off the posing of her Loongsoul dolls. This one has a couple of her Loongsoul 73cm boys, and at the end of the photostory are links to many others, lots of them showing off the posing of Loongsoul dolls (among many others). The photostories are also quite fun. There are a lot of those to go through, though, so if you just want to narrow it down to Loongsoul, here are Girrl's Flickr images of Loongsoul dolls. Search: loongsoul | Flickr - Photo Sharing! Hope it's okay to point to your stuff, Girrl, but I know when I was shopping for Loongsoul, it was your photostories and Flickr that helped me make up my mind! That is such a compliment! Thank you! I do love my huge LoongSoul boys (new photostory in the works, but my camera battery died so the lighting is going to be all wonky, unless I'm "too sick" to go to work tomorrow... hmm...) And they are amazing posers. Seriously Amazing. Hi. I've been thinking of ordering from loongsoul however I can't enter their official site. I can get to the page where it let's you choose Chinese or English but not beyond that.. Does anyone have the same problem or is it just me? The Loongsoul site seems to go down often. Your best bet might be to buy through dealers. Jeeryama sells Loongsoul items via eBay, and Alice's Collections at acbjd.com also carries Loongsoul dolls. I really like the look of the Loongsoul bodies - and I love what I've read about the posing and standing ability. Seriously considering replacing one of my guy's bodies with one of these when I have funds. Will SSDF size clothes fit them? What I've gathered is that SSDF clothes tend to be a bit small for Loongsoul 70cm guys; SID sized clothing fits; EID clothes will be too big on them. Kentarin D'Ley was offering clothes sized for Loongsoul boys but her shop's Facebook page is gone, so maybe she's on hiatus. Stacy's Pink Ocean makes clothes that fit 70cm Loongsoul boys; she uses an Ivan as a model for some of her clothes. White, Normal Yellow, and Normal Pink. Loongsoul also has those three shades in French resin which is more translucent. French resin also comes in two more shades, Real skin (aka Wheat) and Tan skin. If you search Google Images for "loongsoul resin" you can see lots of pictures comparing Loongsoul resin colors to other companies' resin colors. Thanks for the info - Girrl and Zettaichan. I'm kind of hoping I wouldn't have to get yet another set of clothes made for him - he's been on several different bodies and on about the 3rd custom set of clothes! But I'd really rather have him on a body I like that will pose well and can stand properly, if he needs new clothes again then so be it! 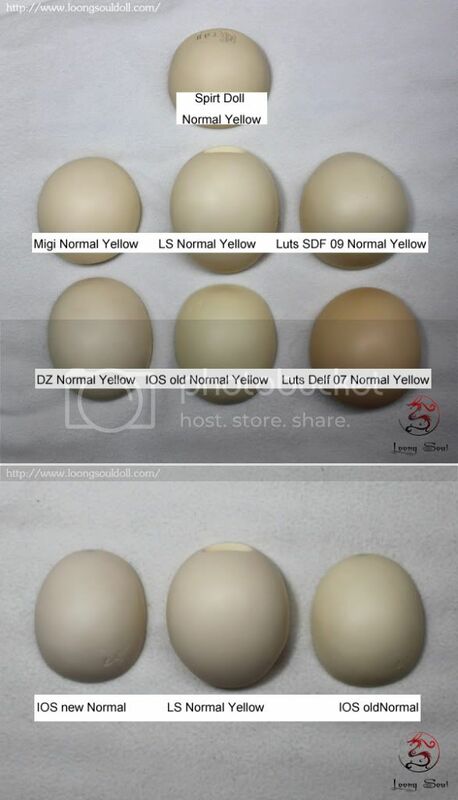 How yellow is the normal yellow resin in real life? Tom is NY (and about 4 years old at this point) The redhead on the left is Dollshe Fresh Skin, and the blond on the right is DollZone NPS. If that's any help.